Jessica Jones and Morgane Grivel. 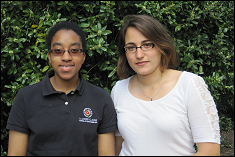 Morgane Grivel and Jessica Jones, graduating seniors, have been awarded NSF Graduate Research Fellowships. The NSF Graduate Research Fellowship Program (GRFP) recognizes and supports outstanding graduate students in NSF-supported science, technology, engineering, and mathematics disciplines who are pursuing research-based master's and doctoral degrees at accredited United States institutions. As the oldest graduate fellowship of its kind, the GRFP has a long history of selecting recipients who achieve high levels of success in their future academic and professional careers. Fellows benefit from a three-year annual stipend of $30,000 along with a cost of education allowance for tuition and fees in the amount of $10,500, opportunities for international research and professional development, and the freedom to conduct their own research at any accredited U.S. institution of graduate education they choose. After graduation, Jessica plans to enter the Aerospace Engineering PhD program at the University of Michigan, Ann Arbor. She will be studying coupled, nonlinear aeroelasticity and flight dynamics for high-altitude, long endurance vehicles with Dr. Carlos Cesnik. Morgane, a University Honors and Aerospace Honors student, is in the aeronautics track (with a minor in Spanish language and cultures). She has worked for Dr. Alison Flatau on synthetic jet actuator testing and has designed, built, and maintained interactives for the National Air and Space Museum as an intern. She is also a Clark School Ambassador and is the president and co-captain of the University of Maryland women's rugby club.